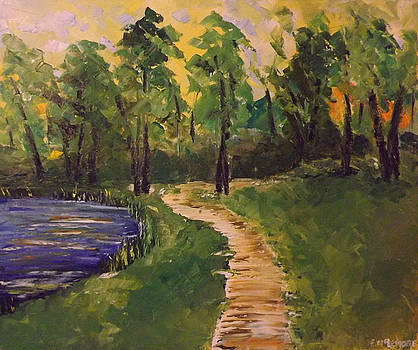 I have very much enjoyed learning about palette knife oil painting from my lessons with Leonid Afremov. His style is all bright colors and very loud, and it totally works for him. It doesn't work for me that well. I have found myself struggling with the brash reds and overwhelming colors. I just couldn't get the color palette to work for me the way I wanted. So, last week, I did what I ask my students to do.. I took a step back and looked at the pieces that I like the most. I mentally broke down the process and decided that my issue was all of the red in my paintings. While red is one of my favorite colors to wear, it isn't working in my paintings! 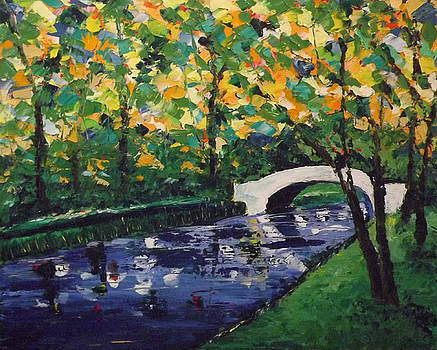 I painted this bridge piece per Afremov's instructions. It was a successful piece, if the goal was to do what I was told. And as a student, that is the goal. I learned the process. But the piece just hung in my studio and in my mind it was blah. So finally, yesterday, I changed it. And I made it mine. I love that the reds and purples are just barely there, providing depth in the colors, but not overwhelming anymore. I have to say, the colors speak to me. And carrying it further, here is a brand new painting done completely without red. I LOVE it. Should you like it as well, you can find prints of it and my other works at Fine Art America.